Jeremy [Howlin' Wolf]: Tell us about your current project "Strider" and how did you become involved in it? Michael Mollo: ‘Strider’ is a side-scrolling game that was original released by Capcom in 1989. It was fairly popular as a NES game and in the arcades as well. The new version was developed by Double Helix Games and supervised by Capcom Japan. My involvement began in November 2012 when I was working on the film ‘Star Trek: Into Darkness.’ I was doing some synth programming and arranging with composer Michael Giacchino at the time. Michael had worked with the Head of Studio for Double Helix, Patrick Gilmore on the ‘Medal of Honor’ series and when Patrick reached out to him for some help, he forwarded Patrick to me. I went down to Orange County and met the team and then spent a few weeks demoing some new materials for the game. Double Helix had a very specific vision for the music for ‘Strider’ and since the franchise already had a distinct sound it was important or me to really nail the music. Jeremy [Howlin' Wolf]: How does this project differ from previous ones? 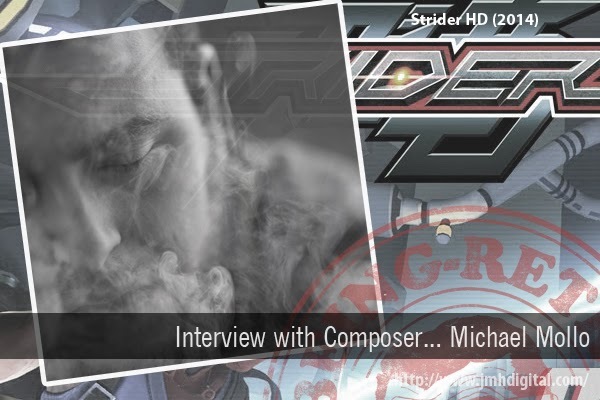 Michael Mollo: For me, this is my first video game score so in that way it was quite different than anything else I’d previously done. Also, this is the first time I’ve worked with existing materials for a score. I had to take into account the music from the previous games in both the arrangements and the new music I was writing. It was a great learning experience both in terms of the technological requirements to make the music interactive but also from a genre perspective. I listen to and write a lot of electronic music, but this score really needed to harken back to the early days of video game music. I spent a good deal of time listening to early chip tune music and really analyzing how it was put together. Jeremy [Howlin' Wolf]: What is a typical day for you, how does it start? Michael Mollo: Well first I gotta get my little girls off to school. Then if I’m lucky I can get in a quick workout before getting to the studio. I’m a guitar player so I usually spend a bit of time riffing and experimenting with either new sounds each day, but it really depends on what kind of project I have going. I try to stay on top of the latest technology as well in terms of samples, or hardware synths so theres always new libraries, patches or synths that I can spend a bit of time testing and learning. You never know when you’ll stumble upon a cool new sound that might just be right for the project at hand. I try to make sure I write at least a bit of music everyday, but some days I can get bogged down the business end of writing music for film and games. But on a good day I can start working on a new tune in the morning and before I know it the sun has gone down.